I first discovered Lebanese pizza when I was studying Arabic at a primary school in outer suburban Melbourne. A Saturday morning "ethnic" school ran out of there each week and I had been placed into Year 9. If you thought high school was awkward, try being 23 years old and in a class full of 15-year-olds for whom Saturday Arabic school is the definition of pure torture. The classes were good, but what truly kept me going back was the canteen at break time. Parents would lug bulging cardboard boxes into the playground and line them up on card tables. Everyone would forget how much they did not want to be there and rush to form a long, jostling line. In the cardboard boxes lay pocket after pocket of warm, savoury Lebanese pizza, each wrapped in a single square of greaseproof paper. There were only two choices - cheese or za'atar, a special herb - and they were ridiculously cheap. I could never decide which to get so I always got both. Those pizzas, eaten on an old bench seat under a peppercorn tree, are still the best Lebanese pizzas I've had in Melbourne. Sadly I no longer attend that Arabic school and am none the wiser where they sourced their pizzas from. 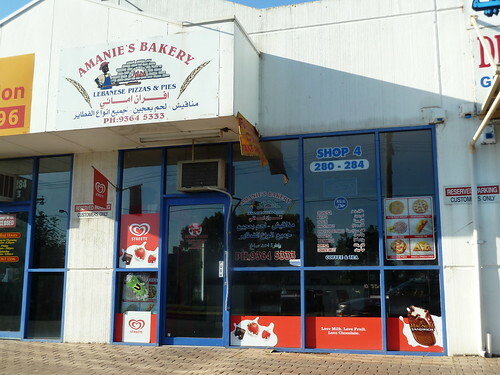 The biggest choice of Lebanese bakeries or makhaabiz (singular: makhbaz) is in the northern suburbs but we have a few options here in the west. 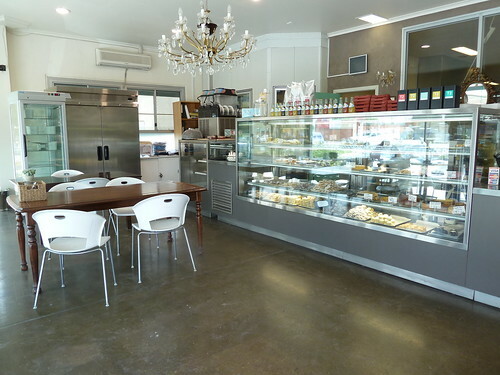 There's the bakery at the Circle in Altona North, a small range at Babylon as well as Al Nada in Spotswood, but none are really a match with what is on offer in the north. That is, until I found Amanie's. 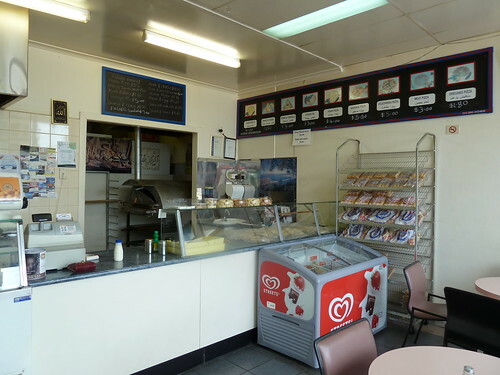 This is a very traditional Lebanese bakery dealing in man'oush or Lebanese pizza. There are a few classic types and they are always insanely cheap. The owner here is really lovely, very friendly. There will be some pizzas ready-made and lying behind the counter, often protected by a long sheet of paper. Make your selection and they will be placed deftly on the floor of the long, flat oven using a special long-handled slidey tool. They seriously only need 1 or 2 minutes before they are piping hot - the oven is kept at such a scorching temperature. 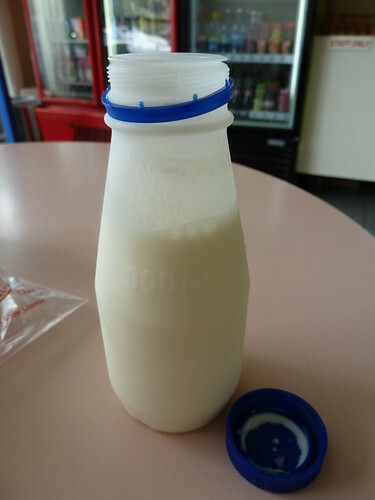 This is one of my all-time favourite drinks - I only know it by its Turkish name, ayran. It's the original drinking yoghurt - thin, salty yoghurt that is tangy and surprisingly refreshing. 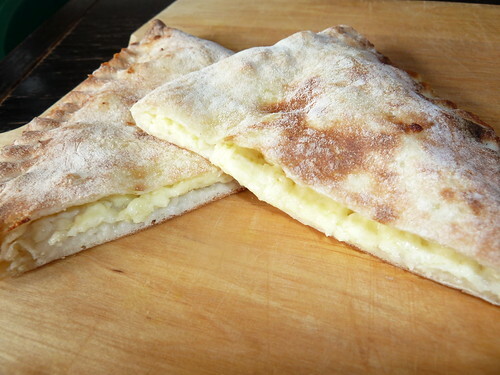 You can make it easily at home but it's somewhat of a tradition to always get it when I have Lebanese pizza. The mothership Lebanese pizza pie. Salty, rich, creamy, almost squeaky on the teeth melted haloumi cheese, sometimes with a little butter, soft and melty in a delicate bread pocket. 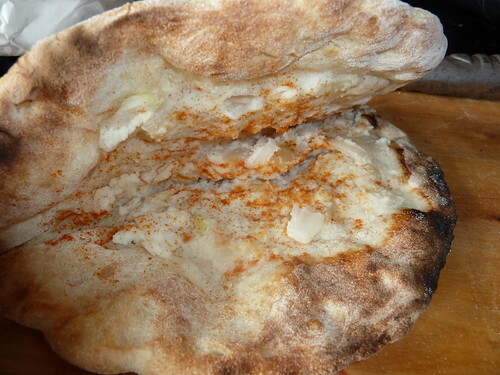 Sometimes the dough can be way too heavy or there is too much cheese (sounds strange, I know, but haloumi is pretty intense) but Amanie's was 100% perfect. This was a perfect example of what is actually one of my least favourite pies. Often the balance is not quite right - there's too much spinach which gets bitter and overpowering, or the bread becomes wet and claggy from the wet vegetables. 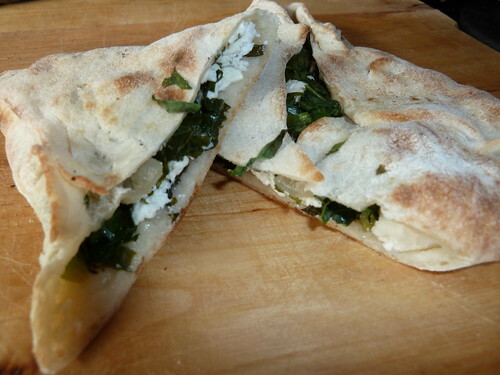 This really was excellent, though - tender, just-cooked spinach with just enough mild feta-style cheese. The plain spinach is also really excellent - it doesn't have any cheese but the spinach is sweated with onion and allspice and is so tasty and healthy. Another classic done superbly. 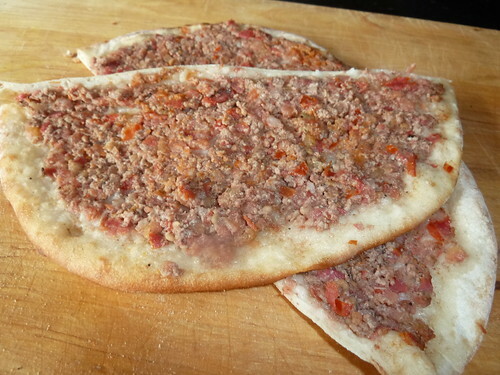 A flat disc of dough is thinly topped with a lamb mince and tomato mixture that is heavy on the onion and allspice. Indeed, allspice is probably the most used spice in Lebanese cooking - something I found quite remarkable at first as I always associated it with cakes. Traditionally this is sprinkled with lemon juice and chilli powder before folding in half. There is always some on the counter; just ask them to add it! The original and always the best. Za'atar is both the name for this indigenous Middle Eastern herb, a kind of local oregano/thyme often translated into English as one or the other. Here za'atar means the spice blend made with the dried herb, sesame seeds, salt and the optional addition of other spices such as lemony sumac berries or cumin. Here it is smoothed onto a simple circle of dough along with olive oil. At around $1.50 each, this is probably the cheapest lunch in Melbourne. They can be filled with tomato, cucumber and other salad items to make a sort of wrap. We like to use them as pizza bases! I was so excited I mistakenly ordered this instead of shankleesh which is a spherical, aged feta-style cheese, rolled in herbs, that is quite delicious when smooshed onto a pizza. Kishik, it turns out, is a fermented and dried grain/yoghurt product that is then rehydrated as a kind of porridge or paste. It tasted to me a bit like mashed potatoes. It was sprinkled with raw onion, lemon and chilli. I wasn't really a fan but it was fun to try something different. Wait til you try this. 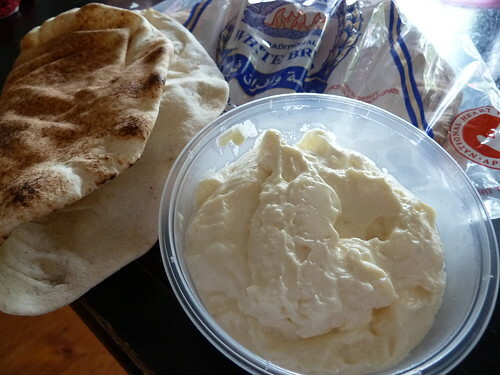 It is Lebanese aioli or toum and it is totally divine. Silky, garlicky, rich yet light. Amazing! This is eaten lots of ways including with grilled meats or just as a dip. It apparently keeps up to a month if you use a clean spoon to take some out each time. We ate it with fresh Lebanese bread from Amanie's - speaking of which, Lebanese bread really should be eaten that day or the next day in a pinch. When fresh it is so fantastic, chewy yet light, and is a million miles away from the horrible stale specimens the supermarket sell up to five days past when they were baked. I am so stoked to find such a wonderful Lebanese baker so close to home. Now the only question is deciding which pizza to choose. 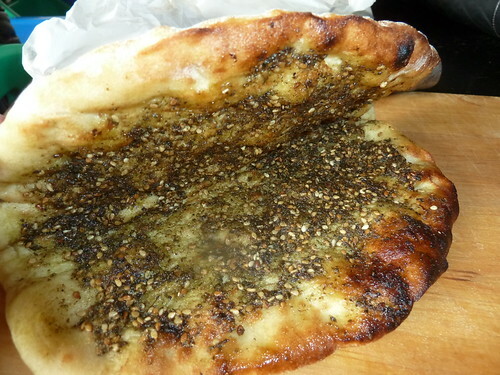 You can always try the Mr Baklover special - take za'atar pizza, open, insert cheese pizza, close. Eat. Genius! For more Lebanese delights, check out Sydney-based Fouad's modern as well as traditional takes on the food of his homeland, augmented by his gorgeous photos and cheeky style, at thefoodblog.com.au. I'm very happy to be participating in From Cup to Crop, a new initiative by Plan International to raise both awareness and funds to fight hunger in the developing world. You can either take part in the Cup to Crop Challenge - living on $3 for food per day, one day per week for one month or choose to donate $3 on top of your bill at participating venues. That $3 will feed a child for a staggering 10 days! As my contribution, I pledge to donate $3 for every meal I have out over the campaign month, 14 March to 14 April. 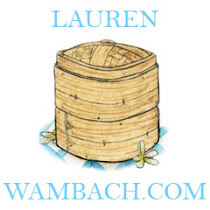 I will keep a tally at the bottom of each post and perhaps you too could consider supporting From Cup to Crop. Sometimes being disorganised is a good thing. 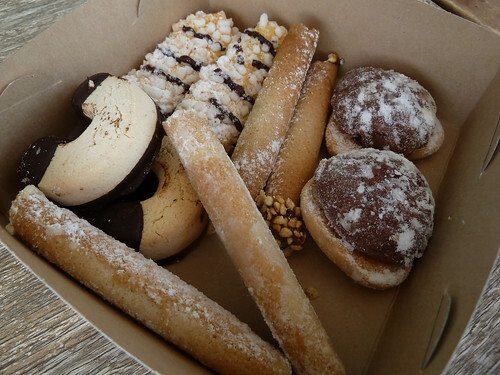 If I had been better prepared that one day, I would have stopped at Cavallaro's for a goodie box of biscotti or even baked something myself. 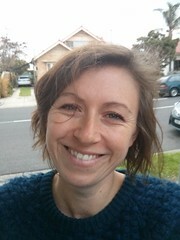 Instead, perpetually late, I rocketed down Ballarat Road wondering if a packet of Mint Slice from 7-11 would be too embarrassing to bring to this friend of a friend's house. Impatiently drumming my fingers on the wheel, suddenly I spied a promising sign and quickly hung a left. 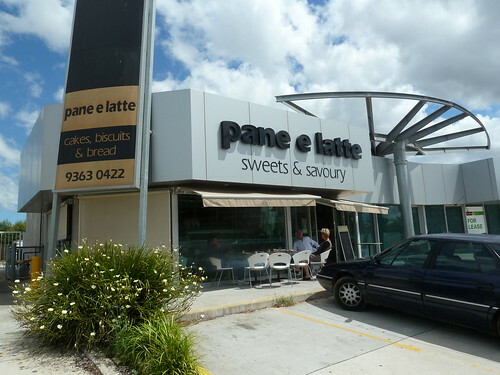 That's how I found Pane e Latte, tucked behind the Deer Park main drag. 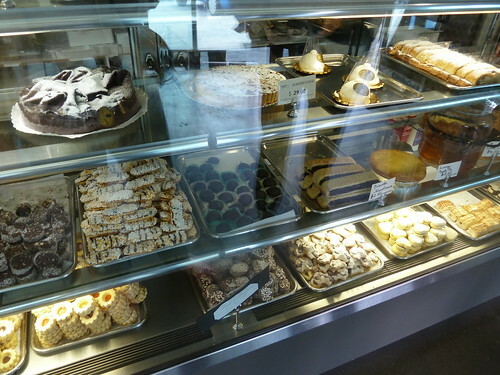 It conceals a fabulous range of delicately and lovingly crafted cakes and biscotti to rival even Cavallaro's. Everything is made on the premises in the kitchen behind, visible through large windows. We got chatting to the lovely owner and she said they are just about function, not style. The decision to provide a retail outlet was an afterthought but in fact I love the style they have come up with - the polished concrete floor and lots of sparkling stainless steel and glass, brightened by the shabby chic chandelier. Biscotti of every shape, texture and filling are for sale - soft chocolate sandwiched between shortbread hearts, decadent chocolate logs sliced into fat discs, delicate crostoli covered in bubbles, some of which pop to provide little craters for icing sugar. There are entire cakes as well as individual portions, even rum baba bobbing in a jar full of syrup. The prices are staggeringly reasonable. 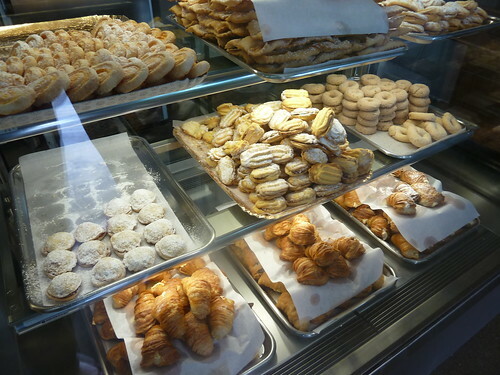 A whole apple pie for $8.60, huge biscotti napoletani for $2.80. Mixed biscotti are sold by weight for $45 per kg. A box of love for about $10. The cigars were unreal, filled with a soft, creamy, white chocolate-like creme. The horseshoes were so short and crumbly, their little legs and backsides dipped in dark chocolate. Swoon! His black shirt dusted in flour, the baker deftly prepared great coffees, a steal for $2.80. 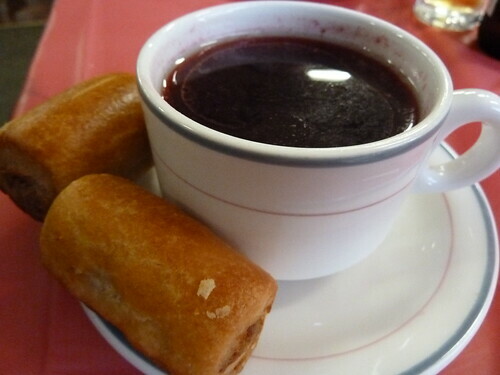 Strong and rich, they went perfectly with the rich pastries. We spied loaves of bread rising in the kitchen and were directed to the other half of the family business, Blu Cow Deli across the parking lot opposite. 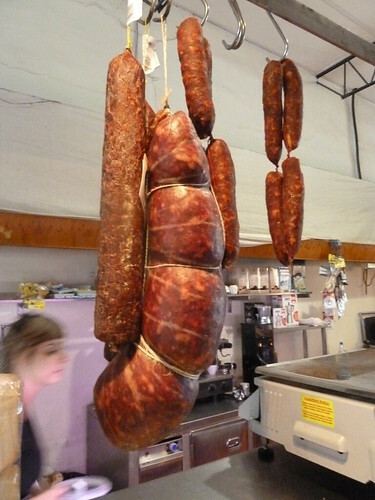 If you have been searching for that elusive amazing western suburbs delicatessen, this might be it. A range to rival King & Godfree - San Daniele prosciutto, incredible salamis and amazing cheeses. Proper pasta and kitsch Italian bath products make this a western suburbs mini-Mediterranean wholesalers. 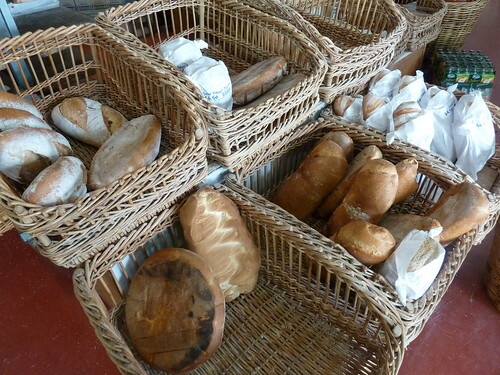 And there was the bread we had spied - big hearty sourdough loaves of all permutations. What a struggle to choose just one! 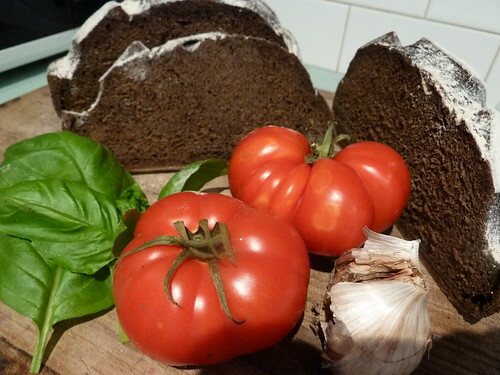 Dark rye sourdough. Actually quite light in flavour but a gorgeous texture, soft yet dense but in a cakey way - quite like mud cake, in fact. Delicious and a very western suburbs $4.20! 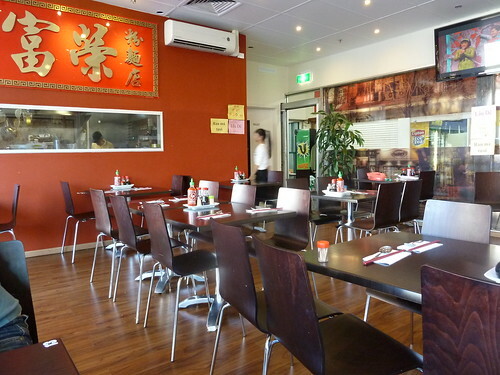 Not long ago Phu Vinh, Footscray's much-loved noodle bar tucked into the side of Footscray market, reopened with a swish new look. Gone are the faded pictures of Phu Vinh's classics which used to abut the ceiling, and the tables and chairs got a snazzy overhaul. Most controversially, as well as their old menu of selected classics, the new menu is much bigger with stir-fries and noodle dishes. 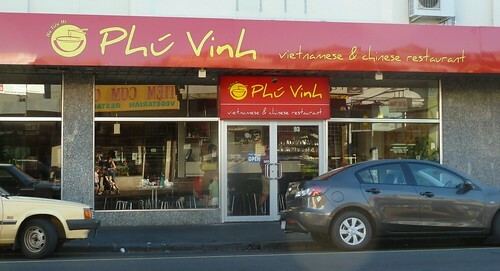 The real question on everyone's lips is whether any of Phu Vinh's culinary lustre got buried in the rubble of the reno. If this Bo Lan Bot Muoi Ot or flour coated beef with salt and chilli is indicative of the calibre of dishes we can now expect, I am a post-reno convert. Oh my God - I seriously daydreamed about this dish for the next few days! 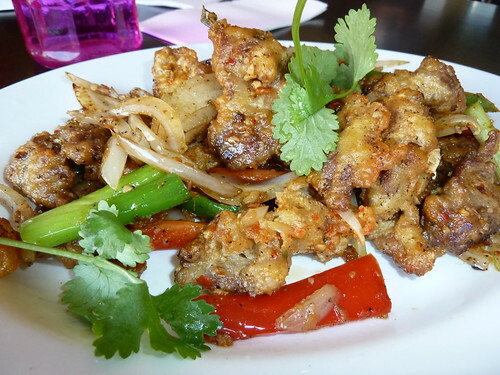 Very tender beef pieces, fried in a light, almost eggy batter and tossed quickly with vegetables in a simple mix of salt, black pepper and chilli. It doesn't sound like much but the ingredients were quality and the execution perfect. With steamed rice and a sprinkle of fish sauce - unreal!! 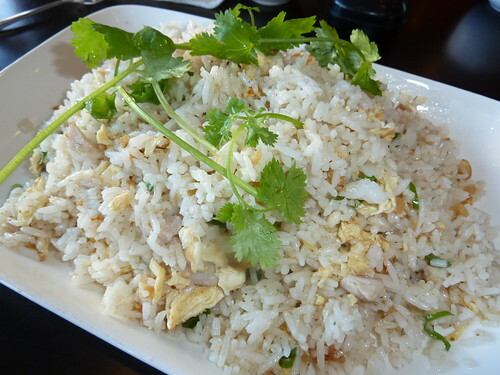 I love this home-style dish - white rice tossed with chicken, egg and just a touch of dried, salted fish, crumbled or chopped into tiny pieces, giving it a fantastic aroma and unparalleled umami flavour. You will also see vermicelli versions around town and they are also fantastic. This is a favourite of Kenny's and George's - a rich beef casserole or soup. 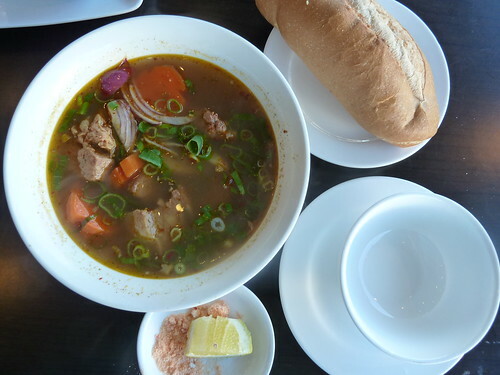 Phu Vinh's version was made with beef ribs and big wheels of carrot, the beef shredding effortlessly from the bones. I am pretty new to this soupy style of bo kho, my main experience being with the other thicker, perhaps more French-influenced syle (as made by Billy's dad as well as Tan Truc Giang). This was much more like a soup and I think would have been better with rice noodles rather than our choice of bread roll. Still, the broth was very rich, complex yet genuine with hints of tomato and cinnamon. It came with a small dish of delicious chilli salt for dipping the beef. 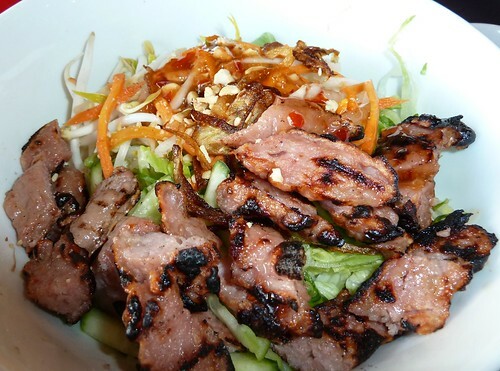 Did Phu Vinh do bun (rice vermicelli) salads before? Anyway, this was really very good. Nem nuong are grilled minced pork patties or kebabs. I have had both the coarsely minced pork style of these and the more processed, spongier style and both are great. This was the springy, very finely minced style, scented with lemongrass and lots of lovely grilled meaty flavour. The bun noodles were perfect with super fresh bean sprouts and other vegies. It was very simple and quite delicious. Phu Vinh do love sweet chilli and this did come with some drizzled on top as well as a bowl of the classic seasoned fish sauce dressing. Just dig your chopsticks in, mix it all up and dig in. There are still so many goodies to explore at Phu Vinh. 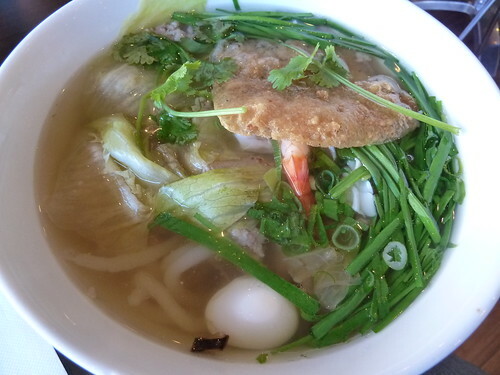 The best thing is, many of the big-menu restaurants have great dry stir-fried or BBQ dishes but unremarkable soups. Because Phu Vinh was a soup and noodle place first, they have those basics down and can only get better. Good on them for the gorgeous new reno and I hope it helps them attract some more of the evening crowd. Reader Melissa sums it up perfectly: No tissue box on the table but the pho and spring rolls were just as good as before. Hooray. "Oh, you will love it!" gushed the real estate agent. "It is right near Barkly Village." Barkly Village! thought I, clasping my hands. Couples strolling hand in hand past sidewalk cafes, cute shops selling objets, the jolly baker passing out a finger bun to every child that passed. "Just turn left at the end of the street and you can't miss it." Five minutes later, heads craning out the windows expectantly, we hit Geelong Road. My husband and I looked at each other. That was it?! That was five years ago and Barkly Village has grown on me. We lost our bakery and our bank, but Aangan has grown from a little seed of a shop to a great restaurant. Perhaps inspired by its success, more Indian grocers and restaurants have moved in and every year the local Neighbourhood House runs a fabulous Diwali festival to celebrate our Little India right here in West Footscray. 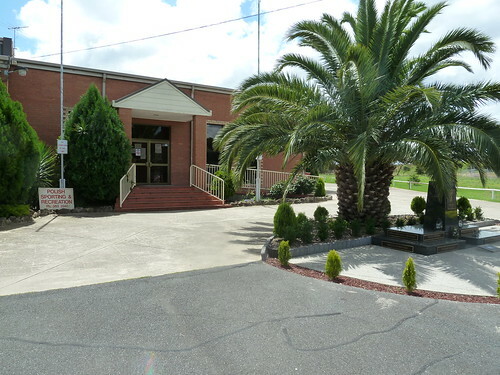 We still have a proper old-school op shop as well as a great library and new street trees. 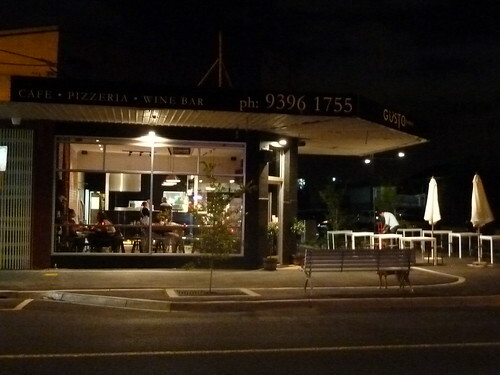 Still, there is much work to be done and hence the arrival of Gusto at Barkly - wine bar, cafe and gourmet pizza shop - was sweet water to the parched throats of West Footscray residents. It's on the old site of Mama Theresa's, a fairly unremarkable traditional pizza shop which I think may have now moved to Newport. The decor is classic inner-city cafe with exposed brick, communal table, interesting mags and lovely long-stemmed wine glasses. I love the arty bulldog banner. 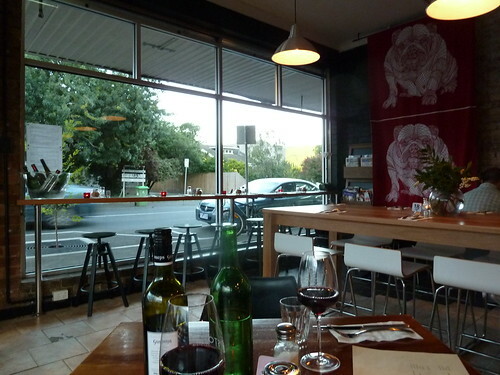 The owners are West Footscray locals and I feel that while Gusto may look like many other chic eateries around town, it's firmly grounded in the Western suburbs. These were great! The eggplant was soft, meaty and amazingly not at all oily. The crunchy coating was perfectly crisp and non-greasy. 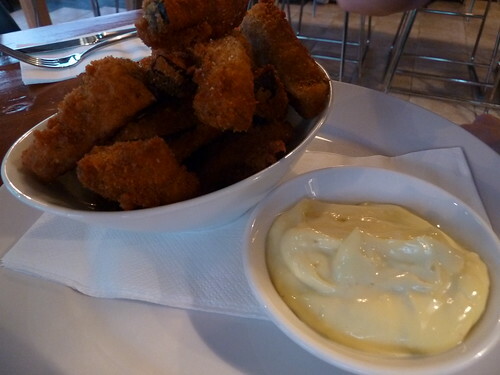 Swiped through the garlic mayo, they were delish. 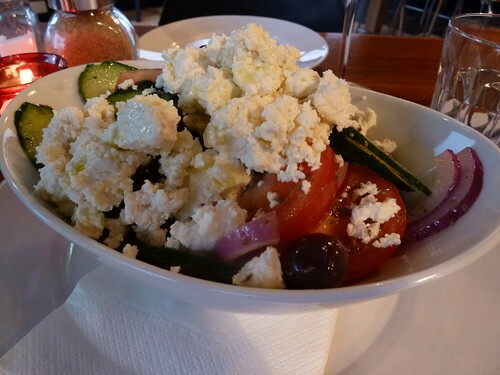 This salad was substantial but lacked some zing - the feta was surprisingly quite mild (too mild for my taste) and the dressing was also a bit light. While they were delectable whole baby ones, there were too many olives all clustered at the bottom of the dish - I mean probably more than 20! 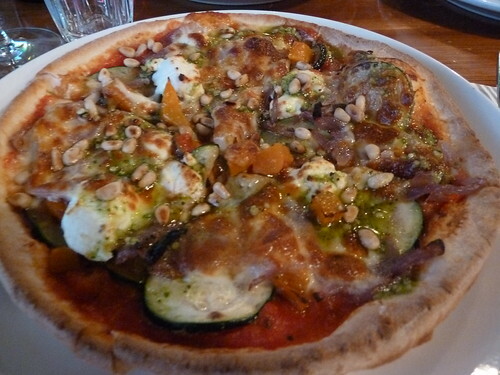 Gusto's signature pizza was excellent - small pieces of roasted pumpkin that were not at all overpowering, mild goat's cheese, wafer-thin zucchini and sweet caramelised onion. The pine nuts were a fabulous textural accent. Despite the presence of ingredients that can easily become overpowering, like pumpkin and pesto, it was very well balanced, with a tasty, well-made crust. An impressive five out of all of their ten gourmet pizzas are vegetarian. Get in early as they do tend to run out of dough quite regularly it seems, based on both my own experience and what I have read online. 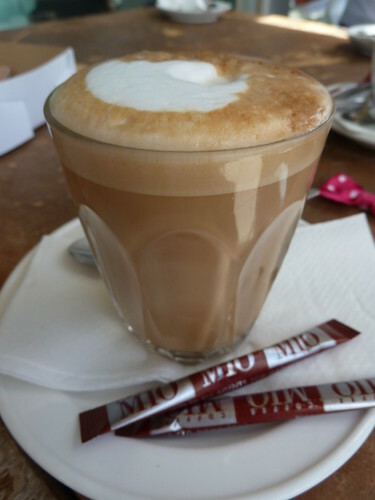 Cheers to good coffee, too - a well-rounded, chocolatey blend from Coffee Supreme served at the perfect temperature. 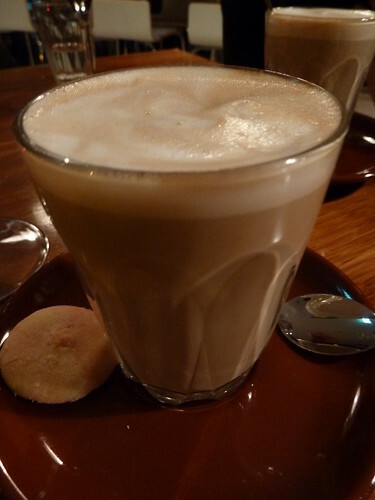 The froth was a little sparse but it really was a very nice latte. Gusto are soon to open daytime and have a spacious outdoor seating area perfect for those with pooches. Sidewalk cafes - check. Shops selling objets - there is a fabulous new shop called Post Industrial Design run by a local sculptor and his partner coming to the old computer shop, further down Barkly Street towards Ashley. They will be opening later this month - watch that space! Baker with finger bun - ok, not really. Unless it were a sourdough bun, perhaps! "Allo!" said the voice. Odd, I thought - surely the Polish Club would answer with some sort of "Good morning, can I help you?" 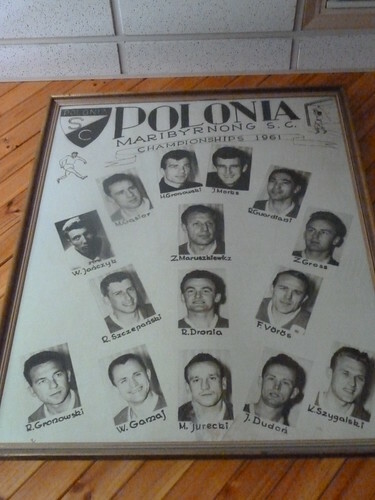 "Er, is this the Polish Club?" I enquired hesitantly. "No, is not Polish Club. Is a Polish man!" said the voice, full of mirth. Inadvertent Googling had turned up the wrong number but when I cheekily asked if he had the number of the Club handy, this kindly stranger was more than happy to oblige. 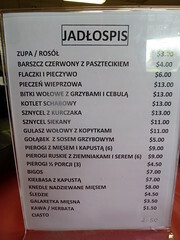 Hence was my first impression of Melbourne's Polish community - helpful, irreverent and quite charming. 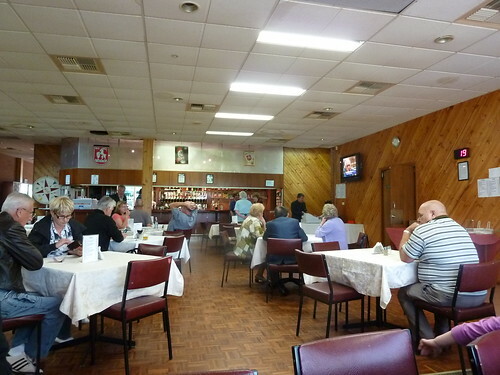 Tucked down a nondescript road in an industrial part of Albion (just to the west of Sunshine) is the Polish Community and Recreation Club which houses a bistro serving up old-country favourites. 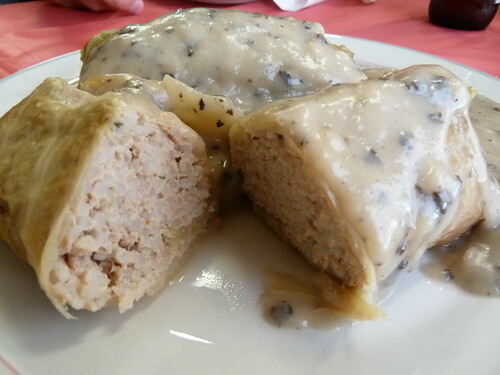 To order, one visits the cashier who produces a receipt to drop into the kitchen, which we duly hand over to a team of gorgeous old Polish ladies moving surprisingly swiftly as they dish up bowls of soup and plates of cabbage rolls. Loving this classic chicken noodle soup. 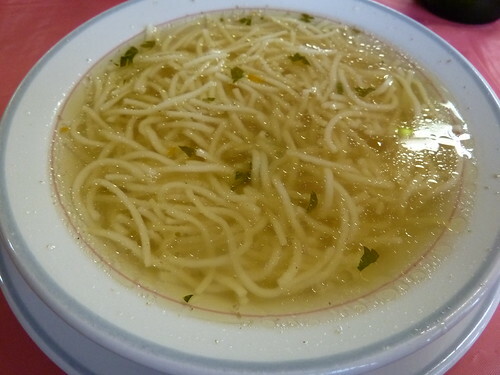 The broth was quite mild, very honest, with lots of perfect al dente noodles. A big grandmotherly-bosomed hug for $3! 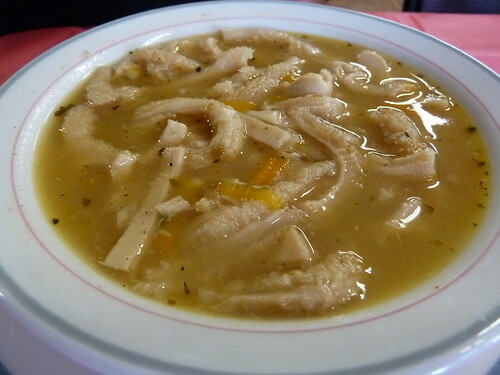 Thick but not too rich tripe soup. Grandpa seemed to like this. I did taste a little of the broth and it was very soothing. No, we have not skipped to coffee and cake - this was the beetroot soup! It actually tasted like warm beetroot juice, quite thin, with a lemony tinge as well as savoury undertones. The pate rolls it came with were like a drier-style sausage roll. Interesting! Insanely generous cabbage rolls for just five bucks each. Big leaves of pickled cabbage stuffed with rice and minced meat, probably pork. The sauce was somewhat like white sauce or cream of mushroom soup. The family loved these although I did find them quite rich. 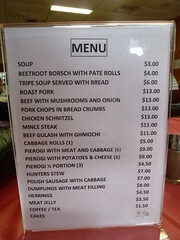 I would say half the patrons were tucking into these so they must be a particular favourite here at the Polish Club. 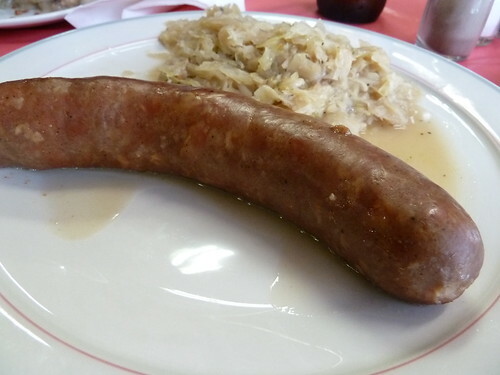 This was the best sausage ever! Its skin pierced with a little pop as a smoky, meaty scent was released and juices spread across the plate. So yummy, rich, juicy and porky. The cabbage was really delicious, cooked perfectly, not at all soggy or bland. Very tender beef chunks with pillowy gnocchi in a rich beef sauce. The execution was great but there's something about the paprika in gulash that I don't really like - it's a sweet paprika that is used, I believe, and to me it has the sickly sweet smell of bandaids. 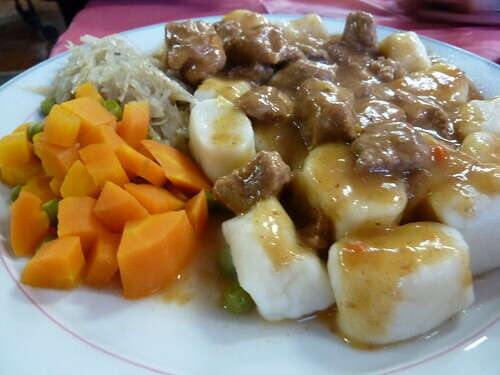 If you like gulash, I am sure you would enjoy this dish. The meat was certainly perfectly cooked and it complemented the well-cooked carrots and delicious cabbage well. Go, go, go there now just to eat these pierogi dumplings! Al dente pastry with a tasty, lean meat and cabbage filling. They have a delicious, interesting minced meaty kind of sprinkle. MMMMMM! A dollop of sour cream would take them to the next level. I was so surprised that I liked this. 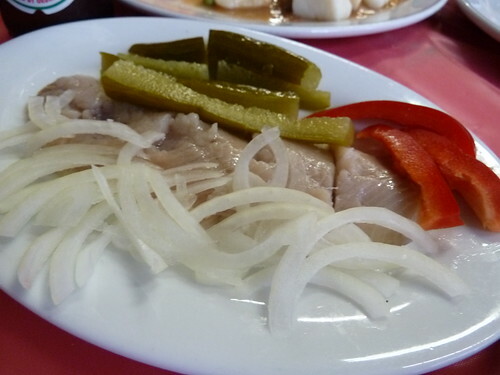 The herring was rich, pleasantly oily, like tuna turned up full blast. This would be so delicious thinly squashed on some great bread. I loved our lunch here. It may not be the type of food I could eat every day but it was warm, hearty and delicious. I could quite happily eat a bowl of chicken noodle soup and a plate of pierogi...or two.